The col between Binn Mhor and Binn Chaoinaigh is called Maumeen (pass of the birds). I reached it after descending from Binn Mhor at the end of a hike over from Corcogemore. What would have been an otherwise careful but straightforward descent of the 36 degree slope was made more hazardous by ice and snow. However I had Simon Stewart’s Maumturk Walk guide downloaded onto my gps and I followed his route to get down safely. Simon’s route can be downloaded onto gps units and is available from his website at http://www.simonstewart.ie/Turks/turk_nw.htm. 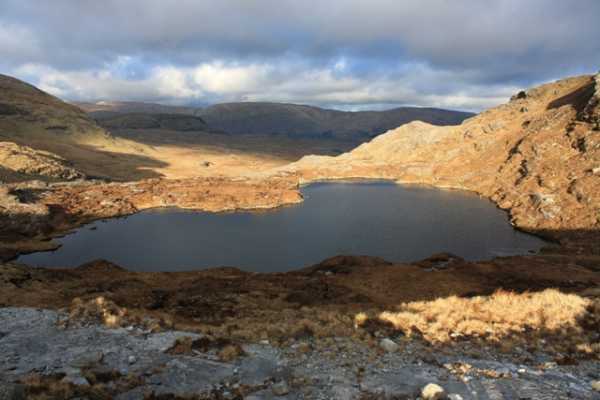 The annual Maumturks Walk blazes a trail across these mountains, covering 24 kms and a total ascent of 2336m. These walkers must be ultimate athletes because, according to the route card, it takes them just over three hours to reach Maumeen. It took me 5 hours 40 mins! No doubt they don’t stop to take 139 photos along the way or pause for breath every 10 steps on the steep ascents. Even so when I reached Maumeen I couldn’t help wondering if it was they who are too fast or me who is too slow. But I walk with the idea of ‘Take your time, have a good time’, whereas when they reach Maumeen the marathon walkers would have another 14kms to go across tough terrain so they wouldn’t be hanging around!